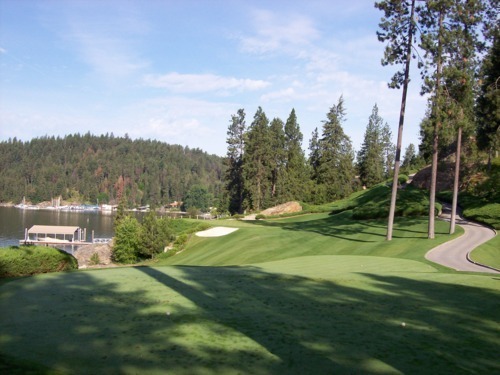 The Coeur d’Alene Resort course was right up near the top of the list of courses I always wanted to play. 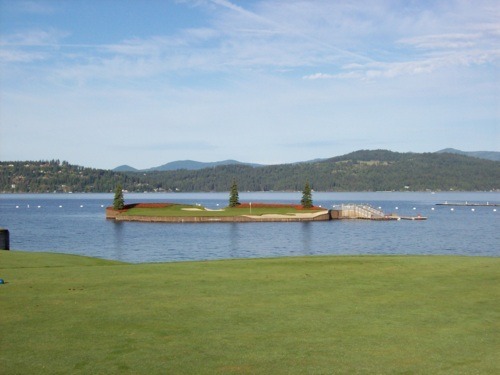 I remember the first time I saw a photo of the famous floating island green in Golf Magazine and I was instantly intrigued. I didn’t really know much more beyond that one gimmick hole, but wow was I surprised. Though that hole is what drew me to play this course, it was the rest of the track I absolutely fell in love with. 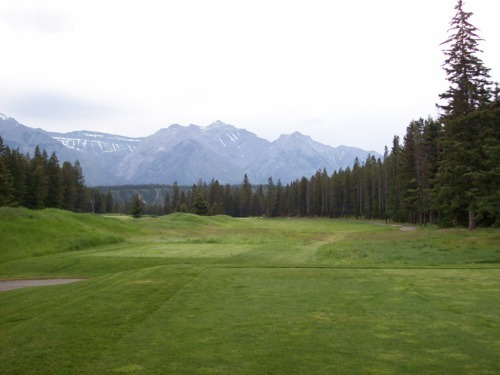 The front nine is exceptional and embodies the mountain golf style that I love so much. 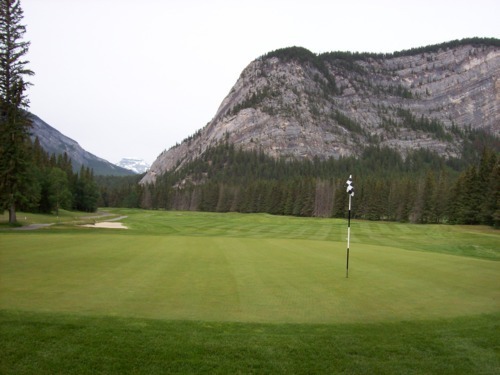 Lots of great elevation changes, tight fairways and well-protected greens. Trees everywhere, a spectacular lake view on many holes and some really unique design features. 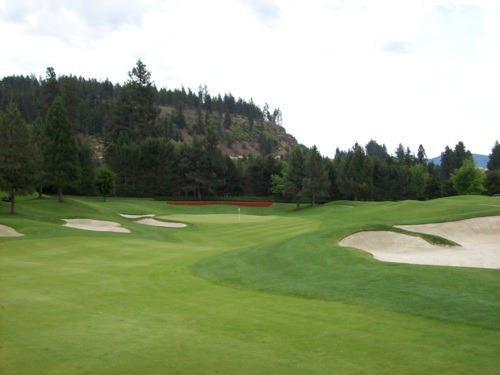 The 5th and 6th holes are truly memorable. 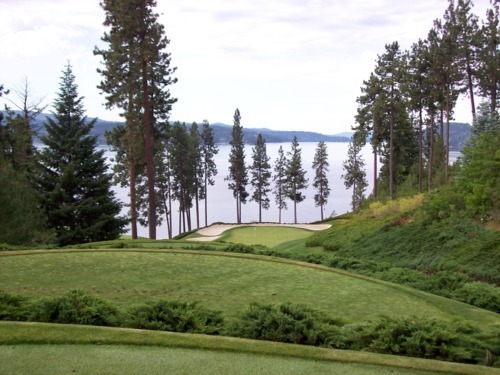 These fun back-to-back par-3’s feature two of the best elevated lake views. The 5th is one of the craziest hole designs anywhere with a multi-tiered, three-leaf clover green guarded by a huge bunker and some massive boulders. The back nine opens up a little bit with a flatter layout. 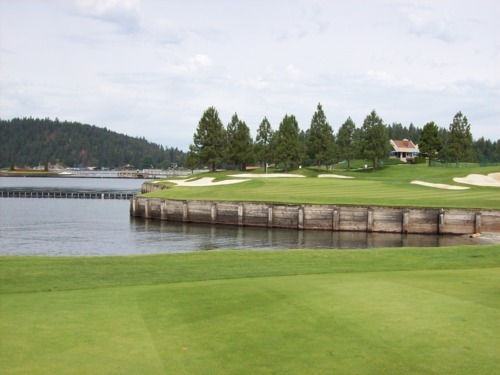 Several holes wind along the edge of the lake and then you get to their signature 14th hole. This is the world’s first (and I believe only) floating island green. The green itself is an island and it is anchored into the lake. 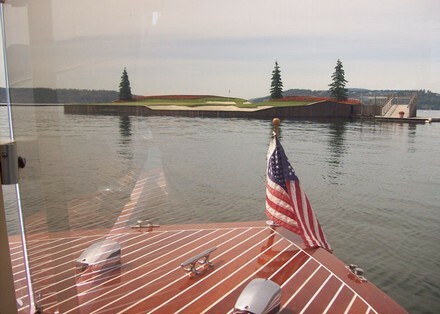 They can actually move it around to change distances and angles from the tee boxes that are on shore. 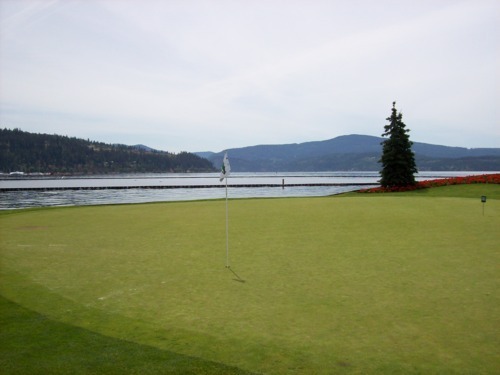 Course rule is that if your first tee ball goes in the water, they’ll let you attempt one more from the tee box. 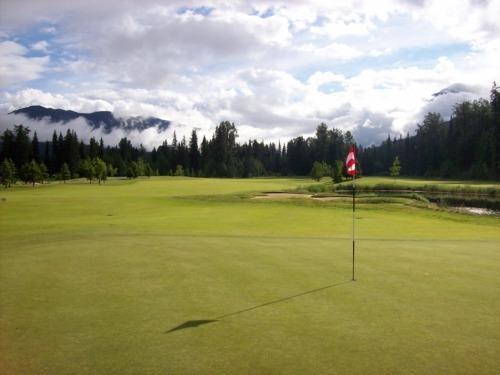 If that one goes in, then you have to drop on the green (yes, the drop zone is on the actual green). Luckily, I hit my first shot onto the green on a got an easy par. 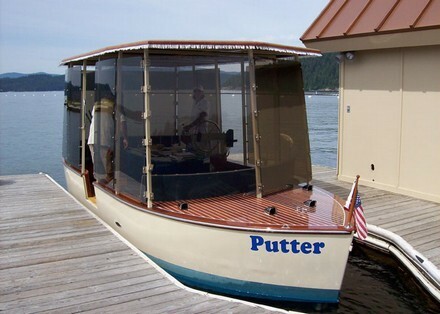 To get to the green, you take a little boat across the lake (aptly named “The Putter”). It’s a fun experience to play this hole. The island is larger than it looks in pictures, so it’s more forgiving than you would think it is. Still nerve-wracking to stand on the tee box, though. 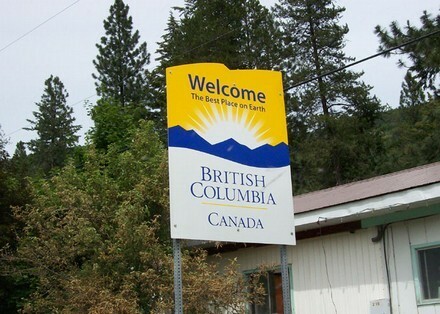 Next, it was time to head across the border and into Canada, where I experienced a bit of heaven and a bit of hell. 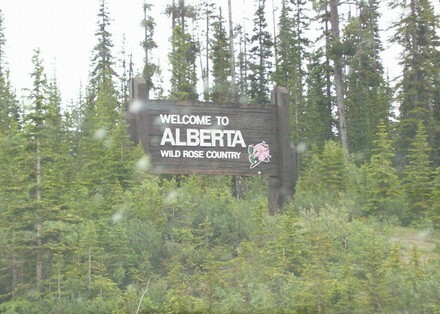 I drove up through eastern BC before reaching western Alberta. 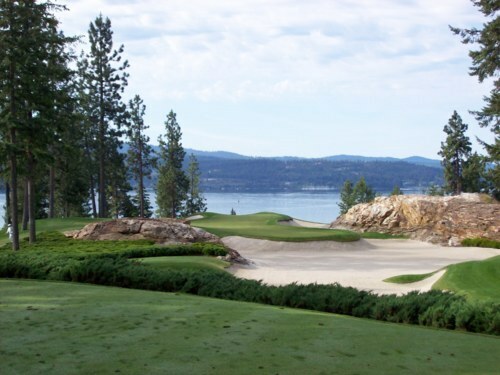 But like Coeur d’Alene, I quickly fell in love with the rest of this course just as much. This is probably the most scenic course I’ve ever played. 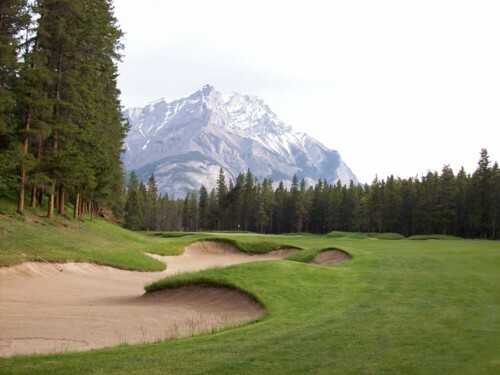 Of course, I am partial to mountain designs. 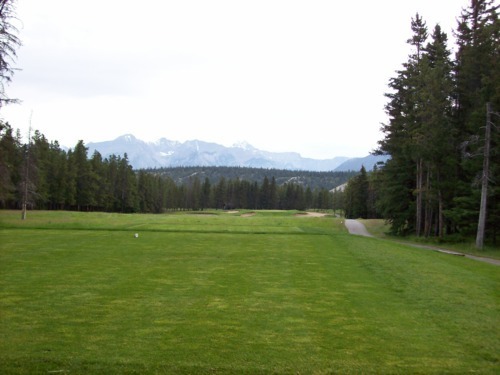 The course itself is relatively flat with only a few elevation changes, but it is set in this incredible valley with the Canadian Rockies all around and a river running through the middle of the course. 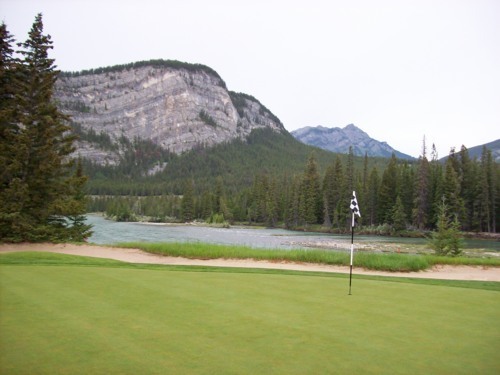 The bunkers are very rugged and natural looking, there’s some distinct mounding and there are some tall grasses framing a number of holes. 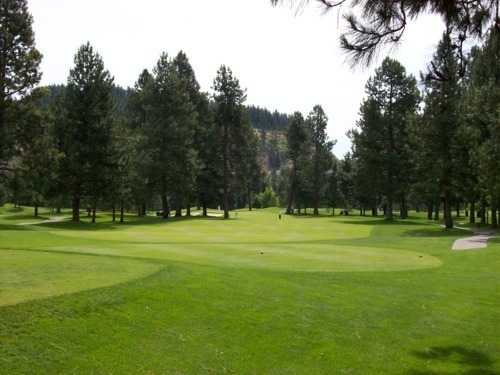 You could say there is a bit of a links element to this design, which is a great contrast with all the big trees and surrounding mountain landscape. 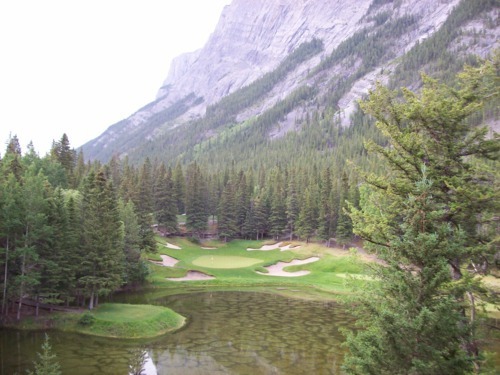 This is a first-class course in one of the most amazing places on earth that I’ve ever been to. 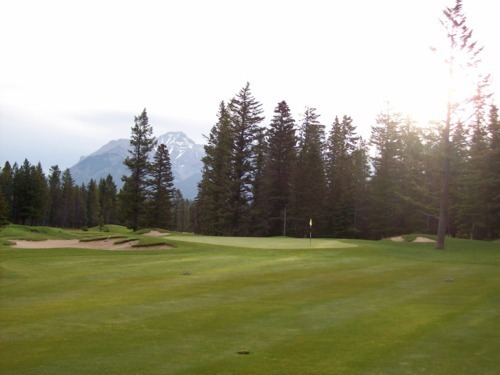 The Canadian Rockies are breathtaking and this course is right in the heart of it all. You can’t ask for more. 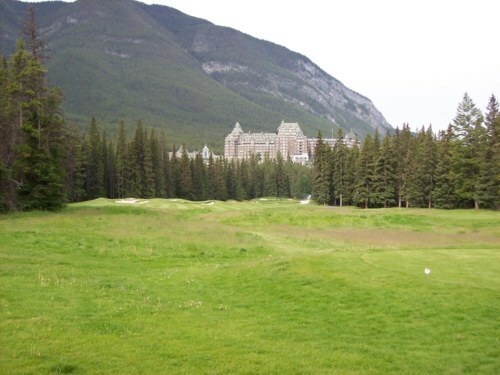 Luckily, I was first off in the morning at Banff Springs. I played with another guy who was a quick player and we zipped through at lightning speeds. I wouldn’t have minded taking more time to soak in the scenery, but it turned out to be a good thing because my drive that day turned out to be the most grueling of this entire trip. Looking at the maps, I saw the Trans-Canada Highway 1 and assumed it was a relatively easy drive. 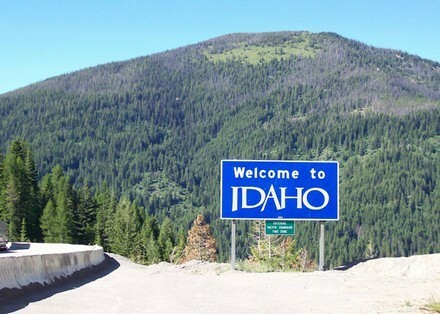 Even though there were plenty of miles to cover, I didn’t realize that the drive would also be pretty slow on this highway. Winding roads through mountains and getting stuck behind a lot of slow drivers really made the drive take a long time. I was staying in Burnaby, British Columbia, just east of Vancouver. By the time I got close to my destination, traffic slowed to a crawl all the way into town. 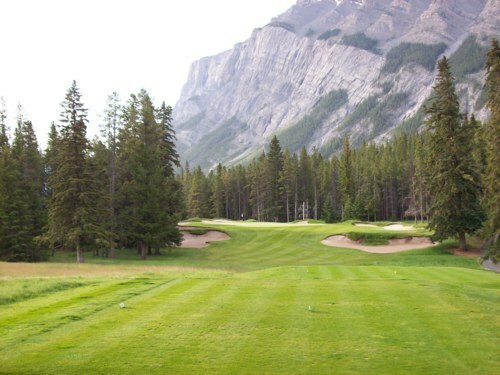 All in all, it took me about 10.5 hours to drive from Banff from Burnaby. It was brutal, and unfortunately it wasn’t the end of the brutality in British Columbia. The next morning, I got up super early after just a few hours of sleep in a sketchy motel. I headed up the coast toward Whistler. 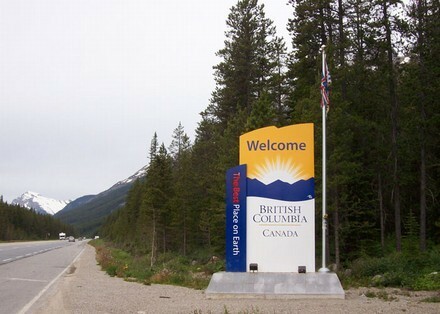 There was a lot of construction on the highway between Vancouver and Whistler because they were expanding the road in anticipation of the 2010 Winter Olympics. It wasn’t too bad early in the morning, but was rough on the way back. 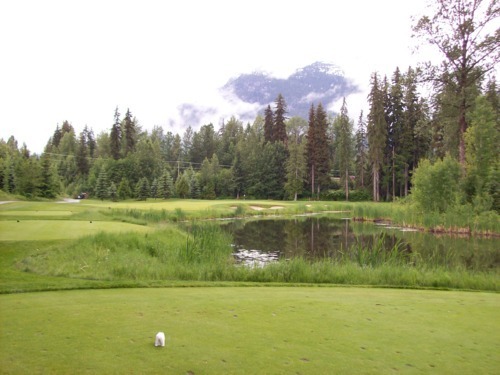 My BC course was Nicklaus North in Whistler. 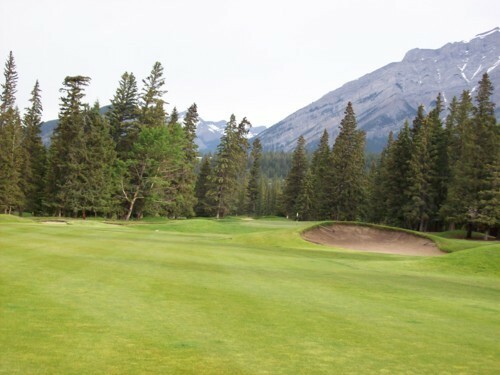 It was designed (as you might expect from the name) by Jack Nicklaus and his group. 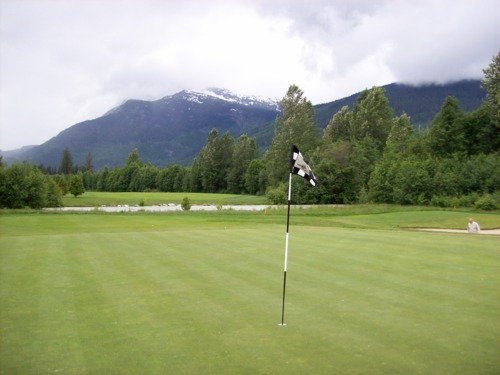 It was a nice course in a very nice area, so the scenery was great. 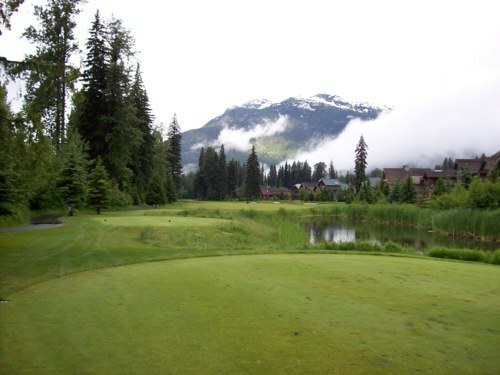 I wasn’t blown away by the course design and I think it was overpriced because of the resort setting. I got a lot of great pictures here, but don’t remember too much about this course in retrospect. 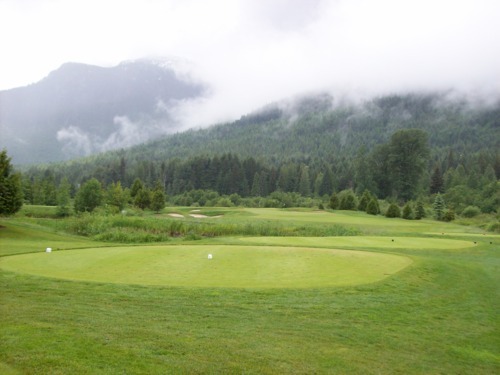 Really, my time in British Columbia was the roughest part of my trip and the round of golf was almost a blur. 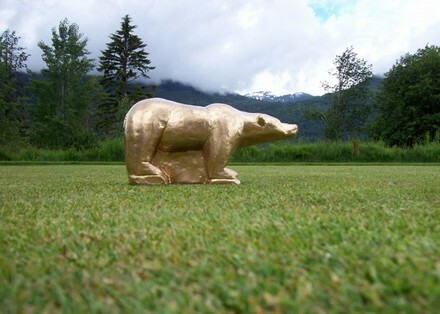 They did have pretty cool Golden Bear tee markers (above)! I didn’t hate the course, but it just didn’t stand out like some of the others. 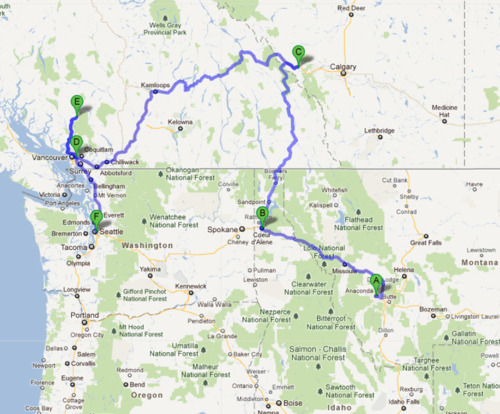 Add to that the fact that I barely got any sleep the night before after such a dismal drive across the BC province. It was also rainy and foggy most of the morning while playing. 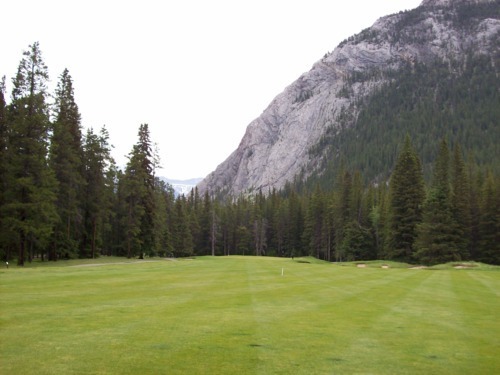 I played Nicklaus North pretty early in the morning, so I was out of there well before noon. 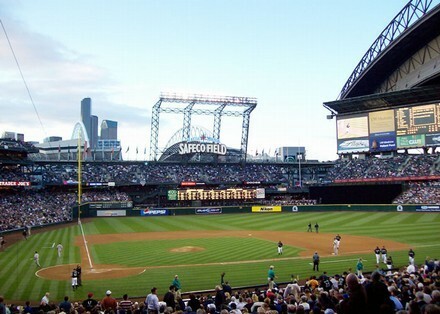 I figured that was just about perfect because that night I had tickets to a Seattle Mariners game (my first visit to Safeco Field). The game was a 7:00, so I thought I had plenty of time to drive to Seattle and even relax a little bit in my motel before heading over to the stadium. Boy, was I wrong! The traffic in Vancouver was the WORST traffic I’ve ever experienced in my life (and I’ve lived in Southern California for almost 20 years now). I got stuck driving through downtown because there’s no easy way around the city. It was raining and it was rush hour on a Friday afternoon, so one car (at most) would get through each green light. It was ridiculous. 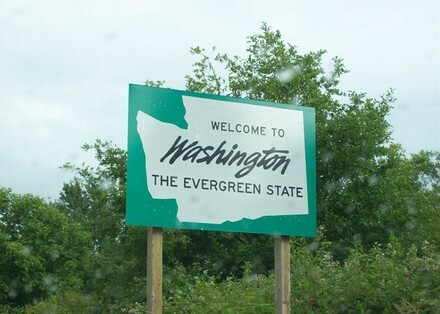 Then, somewhere along the way, I missed the signage to get on the road out of town toward Seattle, so I got stuck in some areas I didn’t even need to be in. I was lost and frantically looking at my map to find another way out. 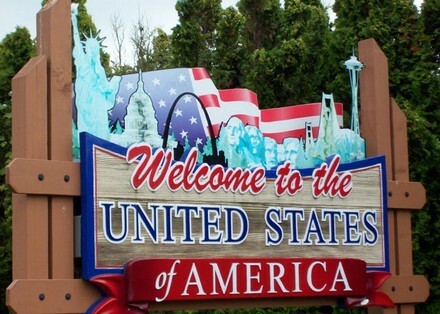 I finally weaseled my way out of the city and onto the freeway toward the U.S. Border. Getting through the border checkpoint was a little slow, as well. So by the time I got to Seattle, it was well past 8:00. I found a parking spot a long ways from the stadium and ran over to catch as much of the game as I could. By the time I got into my seat, they were in the 5th inning. I only sat in my seats (which were nice, expensive seats just behind the dugout) for an inning or two before getting up and exploring the stadium. 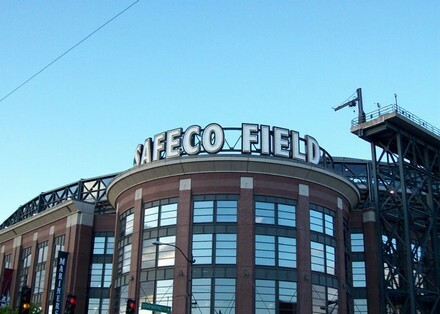 I was glad I at least got to check out the stadium, but I really didn’t get to enjoy the experience very much. At least it did stop raining by the time I reached the city and the roof was open at the ballpark! British Columbia defeated me on this day, but my spirit was about to be renewed the very next day.